This page displays all the campervans that are available for hire in Swansea . If you would like further information or to speak to the camper's owner about hiring their van please visit their Camperbug page, by clicking below. I am scarlet74, hire me today! 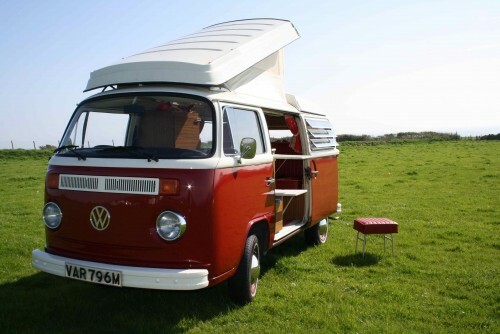 Scarlet is a stunning example of a 1974 Volkswagen bay window westfalia campervan. Right hand drive with its original interior and modern gorgeous leather upholstery to finish her above the rest. It's a Westfalia Continental Conversion, has extra head room with a roof double bed and full width rock and roll bed, allowing her to sleep four and travel five (two front and three rear seat belts). Her 1600cc engine air cooled engine has been fully rebuilt and brand new brakes assembled recently. Volkswagen Westfalia Camper 1969 imported from California. Left hand drive. Turkis and off white with red gingham curtains. Now available for holidays too! Air cooled 1981 VW T25 Bamboo Yellow camper, professional coverted with pop top roof. After experiencing and thoroughly enjoying family camping holidays we now hire out our newly converted blue T5 VW Campervan so others can experience and enjoy these adventures too! Our campervan can be hired for a little as 2 days.